Novruz, or “Novruz Bayrami” as it is referred to in Azerbaijan is a traditional Persian holiday which celebrates the coming of Spring and the New Year. Each of the 4 weeks preceding Novruz is devoted to one of the four elements. Each Tuesday people celebrate the day of one of the four elements – water, fire, earth and wind. People do house cleaning, plant trees, make new dresses, paint eggs, make national pastries such as shakarbura, pakhlava and a great variety of “national cuisine”. Wheat is fried with kishmish (raisins) and nuts (govurga). As a tribute to fire-worshiping every Tuesday during four weeks before the holiday, children jump over small bonfires and candles are lit. Every year this popular, national holiday is not only celebrated by our friends in Azerbaijan, but also by members of the Azerbaijani diaspora around the world and our Houston Azerbaijani community is no different! 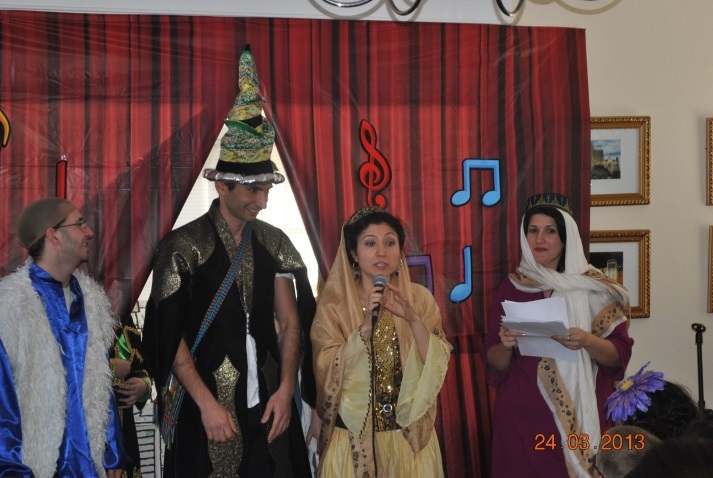 During the past many years, HBSCA’s facilitated the celebration of Novruz with annual Gala Dinner events but this year also a special Novruz celebration for children was added to the program. 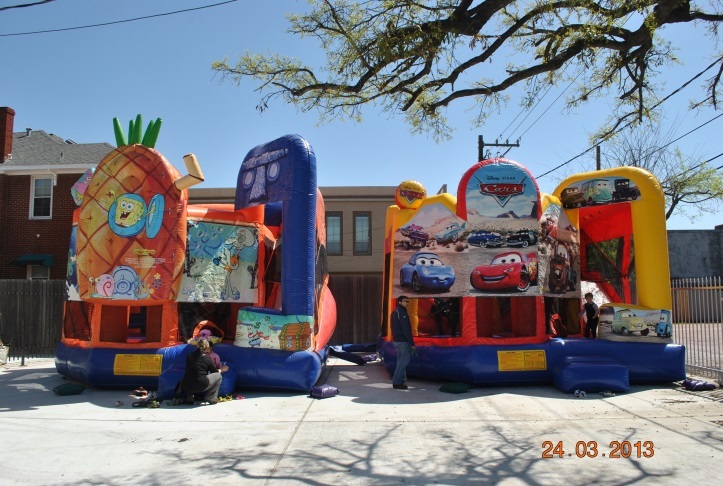 On Sunday, March 24, 2013 the center at Avondale St. in the Montrose district in Houston opened its doors for the community and while the bonfires may have lacked, the children were treated to a special performance by volunteers that told the story of the beautiful Spring Bahar’s quest to be freed from the lair of the evil Father Winter. With the help of Kossa and his friend Kechel, the children participated in a group Easter egg hunt, which contained the clues needed to free Bahar and bring Spring and the New Year to Houston! 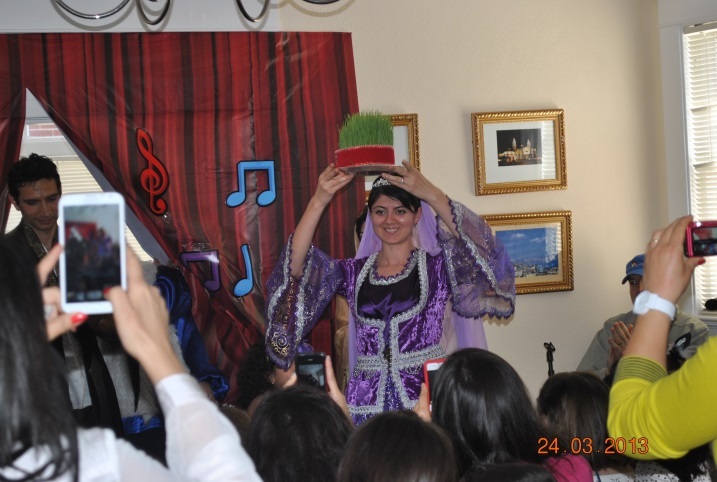 Luckily, the children were able to put together the clues and free Bahar, who after being set free delighted the guests with a beautiful dance that welcomed the Spring! 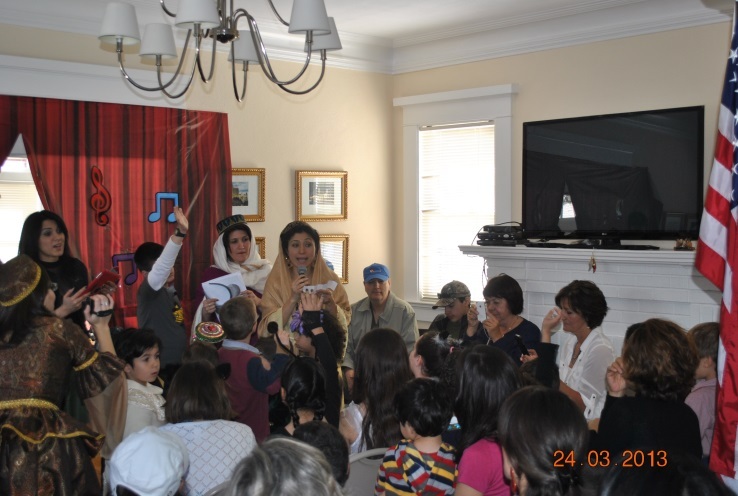 The successful hunt and liberation of Bahar was celebrated with traditional music, dancing, Novruz delicacies and party favors for the kids who continued their Spring adventure on the bouncy castles outside on the patio. A big thank you goes to our sponsors at SOCAR and to the organizers, the kids and all the participants who made this celebration so special. With the coming of Spring, Novruz is one of the happiest holidays that brings families and the larger community together. Don’t forget to join us for the celebrations next year, and more so, don’t forget to sign up for an HBSCA membership as soon as possible! For additional pictures or to watch the excitement as it happened, watch the YouTube videos by clicking below! 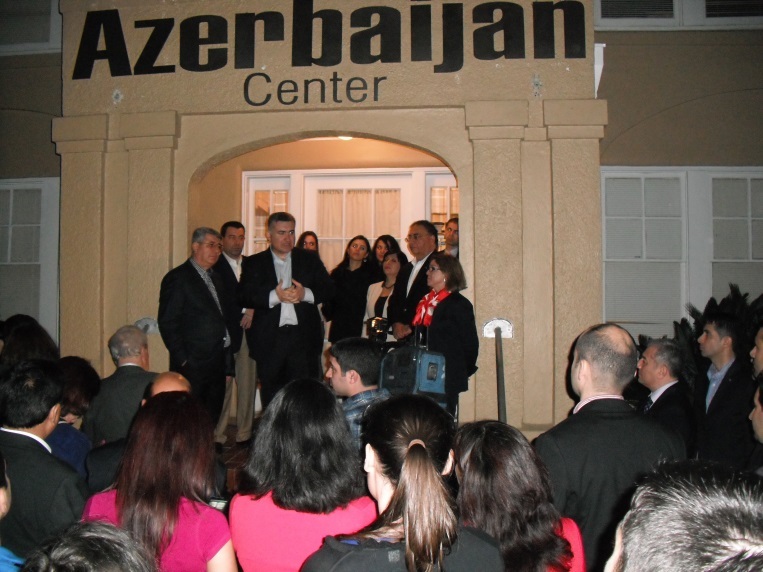 HBSCA welcomes guest delegation to the Azerbaijan Cultural Center. 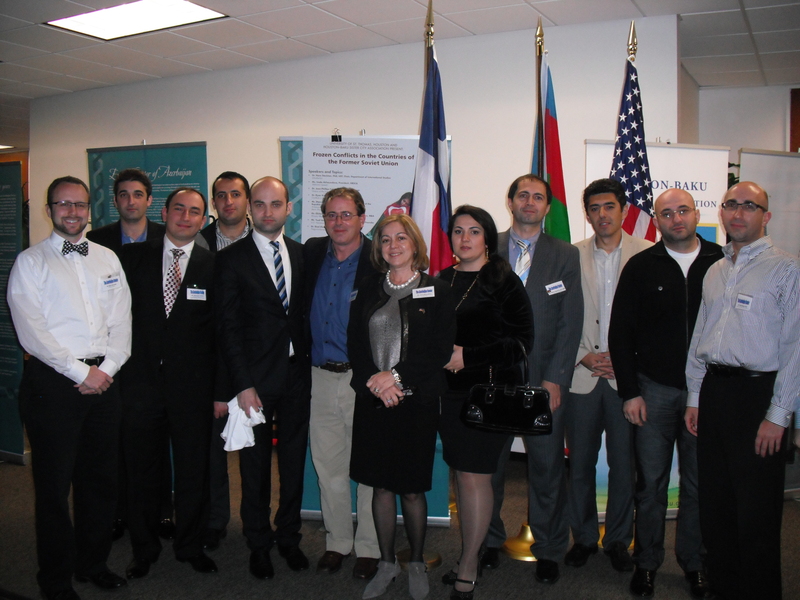 On March 8th, 2013, HBSCA was honored with the visit of a very special delegation from Azerbaijan to the Azerbaijan Cultural Center. 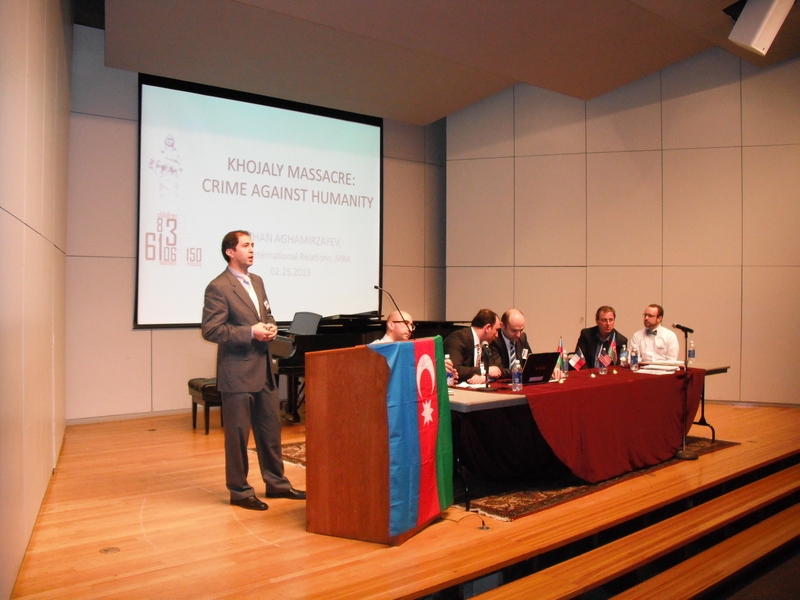 The guests included Azerbaijani Ambassador, Elin Suleymanov, Mr. Khalik Mammadov, VP of SOCAR, Mr. Rauf Mammadov, Director of SOCAR USA, and the Honorable Samad Seyyidov, the Honorable Asim Mollazade, the Honorable Ms. Sevinj Fataliyeva and the Honorable Sabiha Qafarova, all members of the Azerbaijan Parliament. March 8th is also celebrated around the world as International Women’s Day, a day where women are recognized globally for their contributions to politics, society, culture, business and the family. As no Women’s Day celebration should conclude without honoring the great women in our lives, the female guests received bouquets of flowers in gratitude for all their efforts. 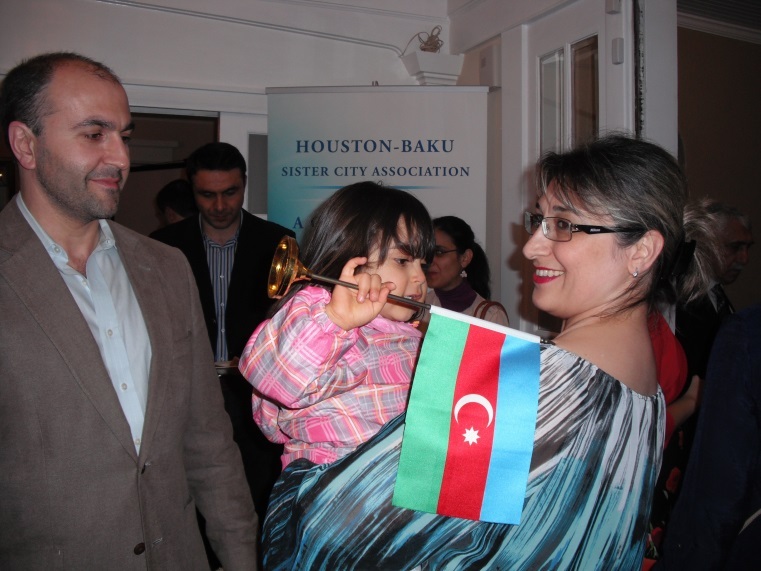 The mission of the Houston Baku Sister City Association (HBSCA) is to promote mutual understanding, appreciation and cooperation between the citizens of Houston, Texas and Baku, Azerbaijan. 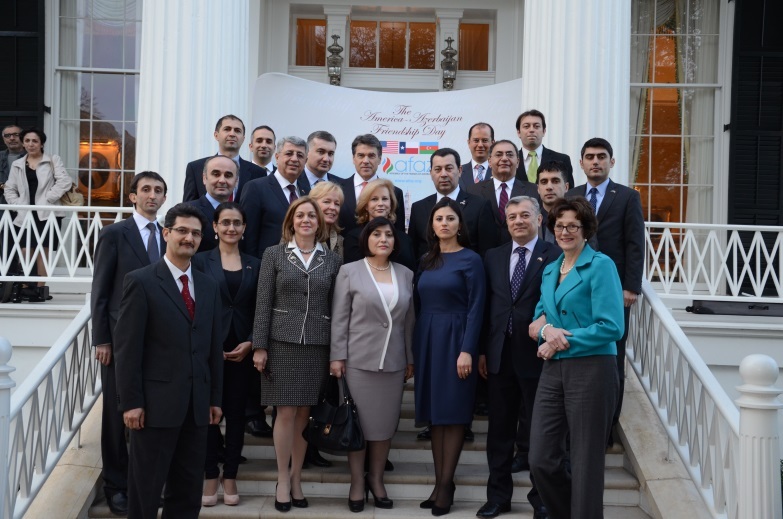 As a nonprofit citizen diplomacy network that aspires to connect these two cities through creating and strengthening partnerships in business, culture and education, it goes without saying that having strong relationships with local and state elected officials in Houston and in Baku are essential to the success of our organization. Maintaining these relationships as well as reaching out to establish new contacts with the officials is an important responsibility of the HBSCA leadership. It is with pleasure that we hereby highlight a few recent connections that were facilitated by our organization under the leadership of President Irada Akhoundova. When Ambassador Elin Suleymanov and SOCAR VP Khalik Mammadov visited Houston earlier this March, HBSCA was honored to introduce the guests to Mayor Annise Parker who welcomed them at Houston’s City Hall. 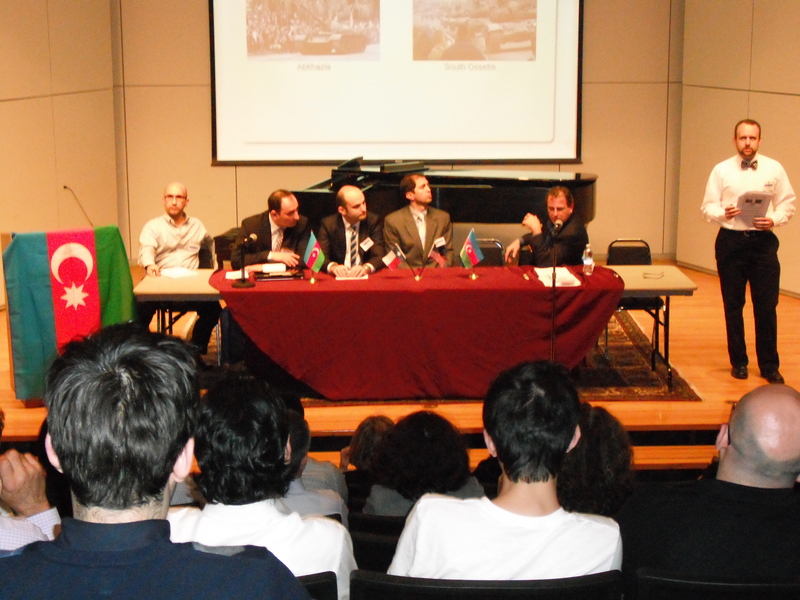 A discussion was held regarding the ongoing special relationship between Houston and Baku and maintaining the economic, education and strategic relationship. 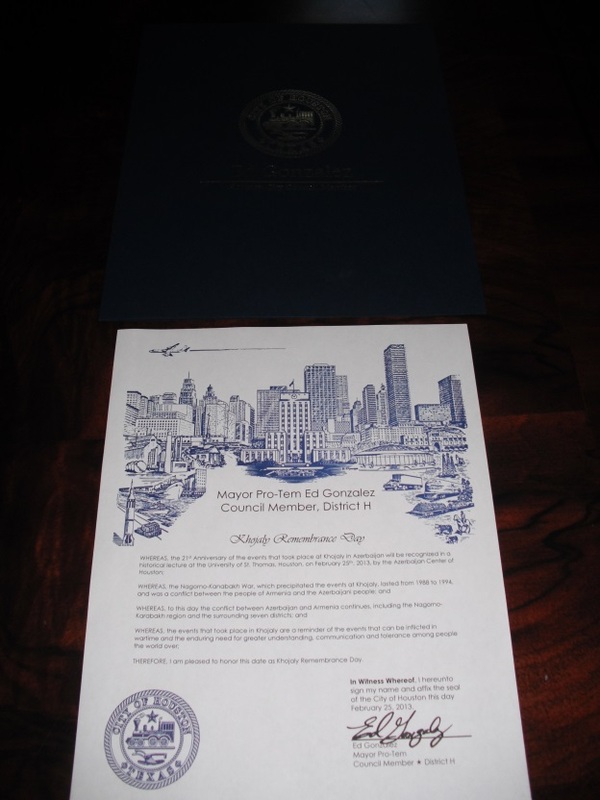 Additionally, Mayor Parker shared that she was planning on making a future trip to visit Baku in the future. 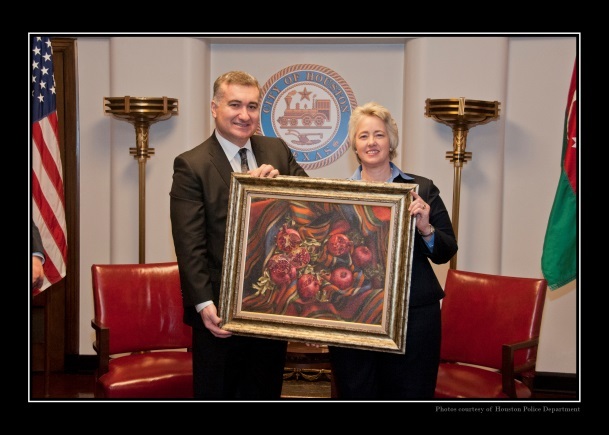 Following the meeting, Ambassador Suleymanov and Mr. Mammadov presented Mayor Parker with a one-of-a-kind painting of pomegranates, a regional delicacy, brought especially from Azerbaijan as a gift for the Mayor. 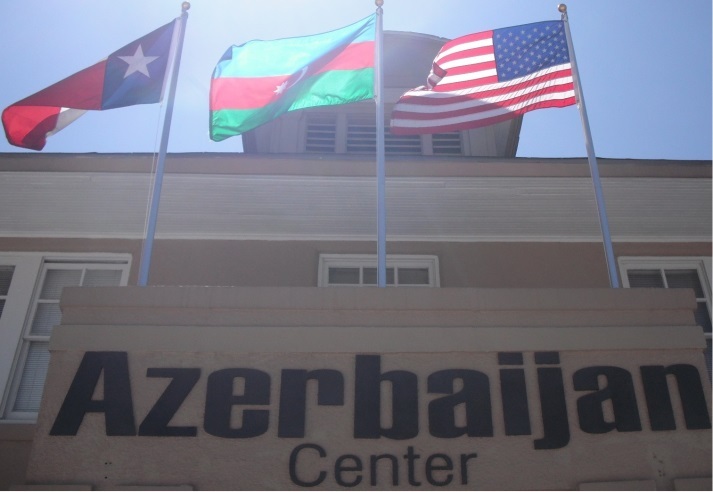 It was a great honor for HBSCA to welcome the delegation of Azerbaijan Government officials on March 8th at the Azerbaijan Cultural Center on the occasion of International Women’s Day. The delegation guests included his Excellency the Honorable Elin Suleymanov, Amabassador of the Republic of Azerbaijan to the United States, Members of the Azerbaijan Parliament the honourable Samad Seyyidov, the honourable Asim Mollazade, the honourable Sevinj Fataliyeva and the honourable Sabiha Qafarova, SOCAR VP Khalik Mammadov and SOCAR USA Director Rauf Mammadov. 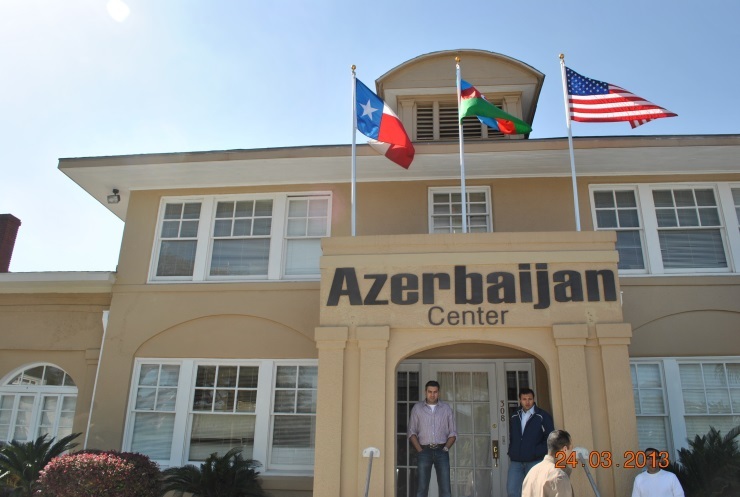 The visit offered a good opportunity for our community to meet with the officials and to demonstrate how the HBSCA community is committed to strengthening the friendship relations between Houston, Texas and Baku, Azerbaijan. The delegation visited Houston as part of a US tour during which they also visited Austin Texas to meet with Governor Rick Perry, Lt. Governor David Dewhurst, House Speaker Joe Strauss, and with members of the Texas State House and Senate. The delegation spoke with a number of elected officials concerning the ongoing relationship between the United States and Azerbaijan along with the continued economic and social support. The guests were hosted on a wonderful tour of the Texas Capitol Building and were invited to join Lt. Governor David Dewhurst, Comptroller Susan Combs and Governor Rick Perry for a number of events and meet and greets in the Capitol Complex. Following the day’s events, State Representative Jim Pitts hosted a reception at his private residence in Austin. HBSCA welcomes the increased level of government relations between the two countries as it emphasizes the importance of our efforts in connecting the two cities, Houston and Baku through cultural, educational and trade exchange programs. Instrumental in arranging for the delegation’s visit was Senator Rodney Ellis, who has been a leading voice of the Azerbaijani people in Texas. 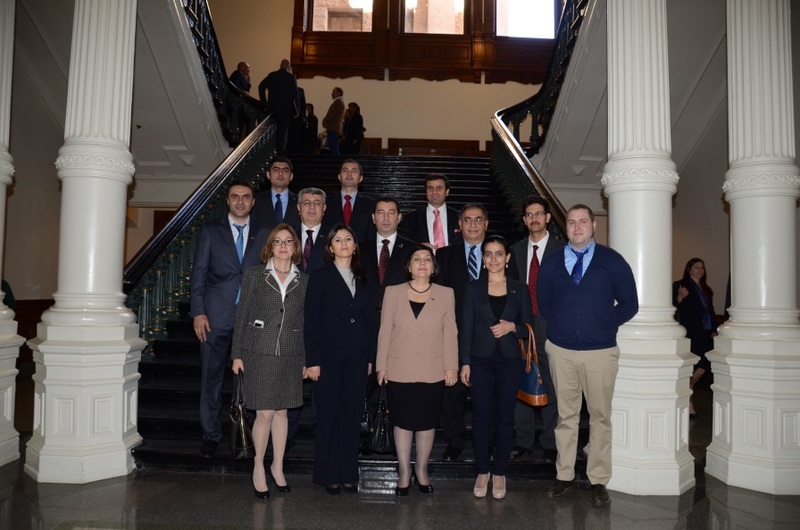 To view the pictures of the delegation’s visit to Austin, click on the below link for our photosharing library at Photobucket! 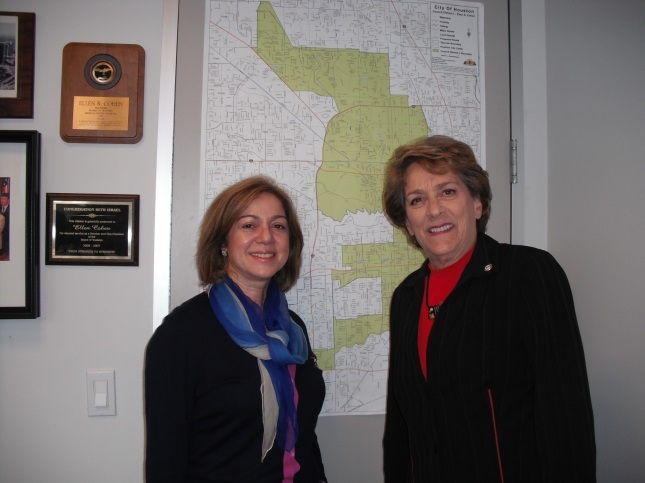 HBSCA President Irada Akhoundova also met with Houston City Councilwoman Ellen Cohen, District C, who represents the district in which the Azerbaijan Cultural Center is located. 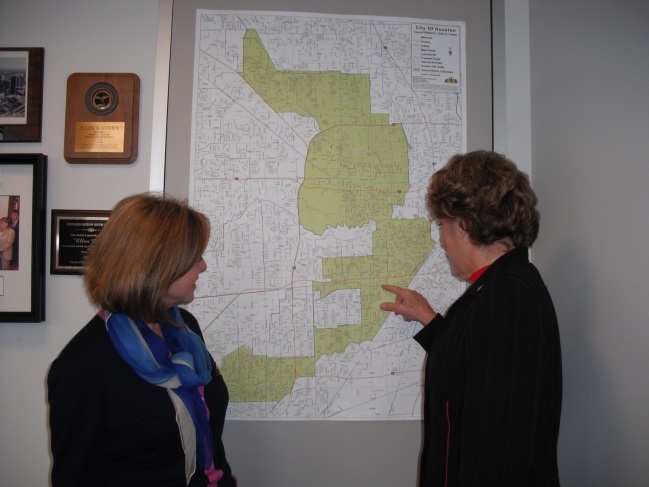 Topics of the meeting included general information about the HBSCA organization and activities as well as a conversation about various issues that may affect the relationship between our two sister cities. Another important meeting was with Houston City Councilman Ed Gonzalez, District H, whose office is co-operating in the plans for the construction of the Azerbaijan Friendship Park which will be located within his district. Councilman Gonzalez and his office will be instrumental in assisting with the planning and procedures required by the City. 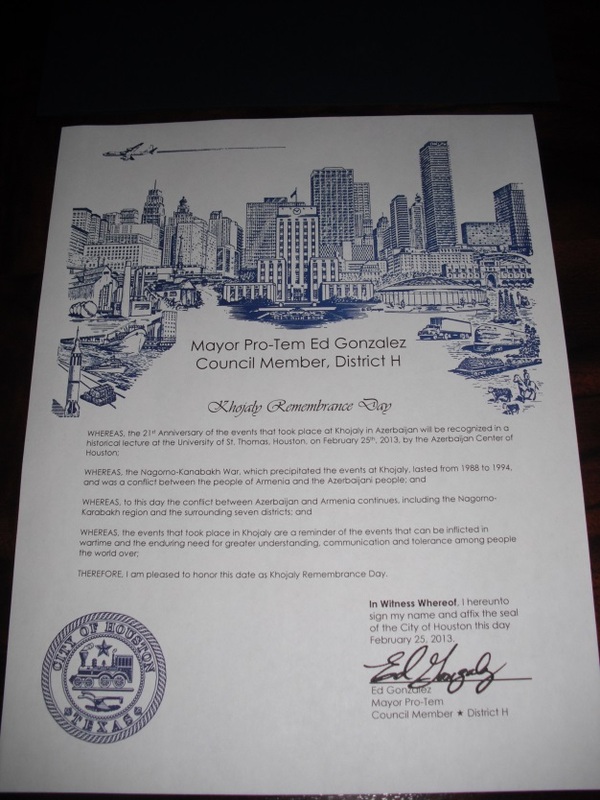 Councilman Gonzalez’s office was also kind enough to present our organization with a proclamation from the city recognizing our recent events in remembrance of the Khojaly tragedy. We are very thankful for all of the elected officials who take time out of their busy schedules to hear about the mission and objectives of our organization and who support our efforts in building relationships between Houston and Baku.